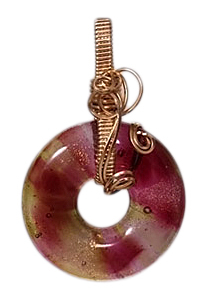 Handmade dichroic donut, crafted by Karen Nan Varela. Shades of mauve, yellow and golden sparkle appear to float across the clear background. Wrapped in 14kt rolled gold wire. Dichroic donut measures 34 mm in diameter. 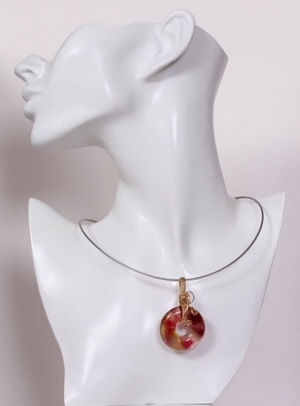 Finished length of pendant is 2⅛ inches. Weight 0.7 oz.